In 2009, the Vikings allowed disgruntled center Matt Birk leave in free agency to the Baltimore Ravens. Birk was the last remaining member of the legendary 1998 Vikings to leave Minnesota and the prevailing theory is that his departure was a big reason for an offensive line performance that was not up to the standards Vikings fans had grown to expect. 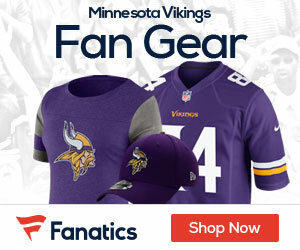 Perhaps the only silver lining to be found in Matty B’s departure to Baltimore is that the Vikings received a compensatory draft pick at the end of the fifth round of the 2010 NFL Draft. With that pick, the Vikings chose Minnesota Golden Gopher linebacker Nate Triplett. As a native of Delano, Minnesota, Triplett joins the Vikings as a 23 year old that us finishing up his senior year as a construction management major at the U of M.
The Delano Honor Roll student had a senior year that featured 127 tackles, 22 for a loss, four sacks, and four interceptions. His production in the high school arena was enough to win him multiple awards throughout the State and also interest from various football programs. As a freshman for the Gophers, Triplett was a red shirted walk on in 2005. In 2006, Triplett played a grand total of five snaps in their season finale against Iowa. In 2007, Triplett began to see a more action as a backup linebacker and special teams ace for the entire season. He received the team’s Bobby Bell Award for being their top special teams player after registering nine tackles. In 2008, Triplett again played in every game and even got to start one. During the season he registered 31 tackles, one for a loss, two batted passes, a fumble recovery, and a blocked kick. 2009 was Triplett’s final opportunity to make a name for himself and he did just about all the could be asked of him. In his senior season, he became a full time starter at middle linebacker and he was second on his team in tackles 105 (60 solo). He also managed five tackles for a loss, two interceptions, five batted passes, and two fumble recoveries. Triplett is known as a hard working guy that will give his all to make sure that he succeeds. He is also known for being aggressive and a dependable tackler. He is particularly fluent against the run and can hold his own if tasked with covering a running backs or tight ends in the passing game (on the college level). Tiplett is not elite at any one thing, but is a blue collar type of guy with a well rounded skill set. He needs get stronger and work on fundamentals, but it is within the realm of possibility that he finds a home in the NFL as a special teams ace. At 6’ 3” and 250 pounds, Triplett is not one of those Farwell-type guys that is trying to beat the odds based on a lack of size. He is a big, strong linebacker but lacks in athleticism and experience. While it was probably an unexpected invitation, Triplett did not manage to be a “Top Performer” in any Combine event. The Vikings and their fans would love to see this develop into some sort of “Rudy” type of story, where the local kid comes from out of nowhere and succeeds beyond all expectations. The Delano native becoming a member of the local Pro Franchise couldn’t hurt their public image as they push forward for a new stadium, after all. However, Triplett’s story could end quicker and with less fanfare than we hope. Right now, he would have to play way beyond his means just to make the roster as a 3rd string special teamer. This pick was disappointing at the time the Vikings made it, and I suspect it may continue to be a pick that is widely regarded as a waste… particularly when you consider the quarterbacks that were still available at the time. I hope I am proven wrong, but this pick is just as much of a head scratcher today as it was last weekend. It is possible (some might say likely) that our compensation for letting Matt Birk leave will never play in an NFL game. But then again, you can’t really have a “Rudy” type of story without a bunch of people doubting the kid. Only 1 highlight? Hopefully he makes the practice squad. Will be tough for him to do that but best of luck to him and the other late round picks. I think pretty much all picks in rounds 5-7 were disappointing. Triplett was a full scholarship player at the U. Mason recruited him and committed in the spring of his Jr. year of high school.